Calculating God is the new near-future SF thriller from the popular and award-winning Robert J. Sawyer. An alien shuttle craft lands outside the Royal Ontario Museum in Toronto. A six-legged, two-armed alien emerges, who says, in perfect English, "Take me to a paleontologist." It seems that Earth, and the alien's home planet, and the home planet of another alien species traveling on the alien mother ship, all experienced the same five cataclysmic events at about the same time (one example of these "cataclysmic events" would be the meteor that wiped out the dinosaurs). Both alien races believe this proves the existence of God: i.e. he's obviously been playing with the evolution of life on each of these planets.From this provocative launch point, Sawyer tells a fast-paced, and morally and intellectually challenging, SF story that just grows larger and larger in scope. The evidence of God's universal existence is not universally well received on Earth, nor even immediately believed. And it reveals nothing of God's nature. In fact. it poses more questions than it answers.When a supernova explodes out in the galaxy but close enough to wipe out life on all three home-worlds, the big question is, Will God intervene or is this the sixth cataclysm:?Calculating God is SF on the grand scale. Calculating God is a 2001 Hugo Award Nominee for Best Novel. 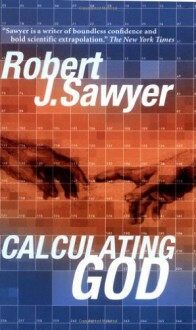 http://pablos.booklikes.com Pablos czytelnik 3.5 Robert J. Sawyer - "Calculating God"
text Robert J. Sawyer - "Calculating God"